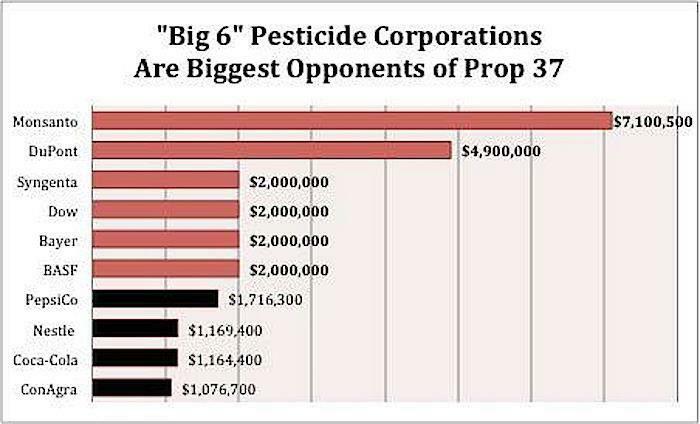 – Vermont: H.722 was eventually discarded after Monsanto threatened a lawsuit. – Connecticut: HB 5117 was rejected after Monsanto threatened a lawsuit. The fact that it was a bunch of citizens who couldn’t be sued made pro-GMO companies very nervous. 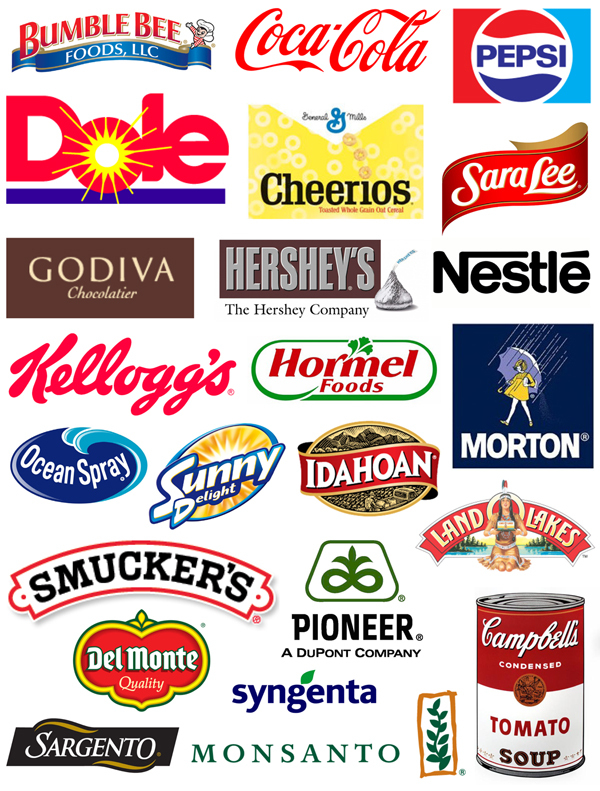 So nervous in fact, that a group consisting of many of the top names in the processed food industry (including every one of the labels shown at left) joined up with Monsanto to finance, develop and distribute anti-GMO labeling publicity. By the time citizens were ready to cast their vote, this group of anti-GMO labeling companies had spent approximately $43 million on television commercials, YouTube videos, a website, social media, multiple mailers, print advertising, and even an “activity” booklet for children titled “Look Closer at Biotechnology” to create as much voter confusion as possible. With $43 million at their disposal, tactics ranged from using a fake FDA quote and mailers that fraudulently displayed the FDA seal (a criminal complaint has been filed with the FBI, but the FBI is simply referring the complaint back to the FDA, which, being controlled by several ex-Monsanto VPs and attorneys, probably won’t go much further), to fabricated front groups, and even impersonating a police organization (among others) to send out more mailers opposing GMO labeling. The majority of these publicity efforts were handled by the same high-powered PR firm who was responsible for helping Philip Morris and R.J. Reynolds in the “Californians for Smokers’ Rights” initiatives back in the 1980s and 1990s, and more recently the big oil companies’ fight against clean energy and climate laws in 2010. 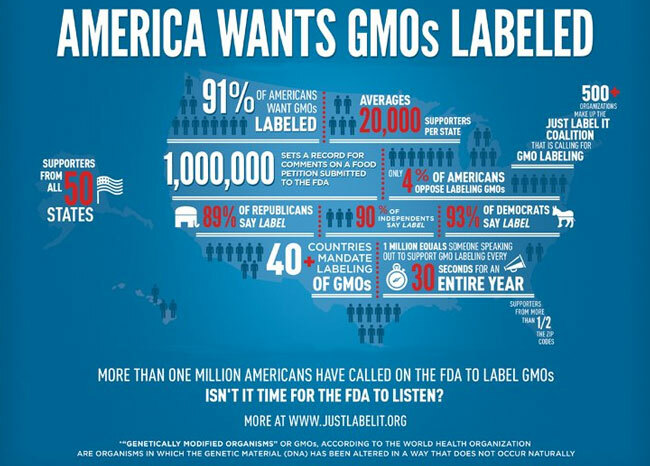 As a result of all the confusion and “faux facts,” California’s Proposition 37 failed to make GMO labeling a reality. 1) Keep sharing the truth. This page is packed with cross-referenced studies showing the inherent risks and proven health impacts resulting from genetically modified organisms. This video is a great way to wake up your unaware friends—especially those with children. 2) Sign a local petition. 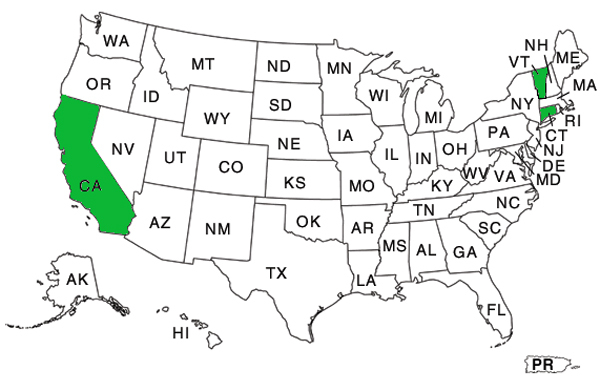 Visit your nearest natural / organic grocery store / food co-op or farmer’s market, and ask them if they’ve started a GMO Labeling petition you can sign. If not, give them this letter and ask them to consider starting one. If they won’t, you can always start one of your own! Dean Foods Company: manufacturers of Silk and Horizon organic products… talk about walking both sides of the fence! General Mills, Inc.: manufacturers of Betty Crocker, Bisquick, Gardettos, Gold Medal, Green Giant, Haagen Dazs, Hamburger Helper, Larabar, Muir Glen, Mountain High, Nature Valley, Pillsbury, Progresso, Totinos, Yoplait, and more breakfast cereals than I can list. This graph was compiled in September 2012, view the total contributions by these and other related companies here). In addition to the above food manufacturers, why do you suppose the world’s top chemical manufacturers—those responsible for DDT, Agent Orange, and other formerly “proven safe” chemicals—are taking the lead in preventing you from knowing what’s in your food? Even though “Big Ag” spending caused enough confusion with their “faux facts” to defeat Proposition 37, we are confident that US citizens will be even more prepared for the next labeling initiative. Until then, make sure you vote with your wallets at the grocery store by avoiding the list of food manufacturers and products shown above! Organizers in multiple other U.S. states have begun building labeling campaigns, under the banner of the “Coalition of States for Mandatory GMO labeling.” These states include Arizona, California, Connecticut, Colorado, Florida, Hawaii, Idaho, Illinois, Iowa, Maine, Massachusetts, Minnesota, Mississippi, New Hampshire, New Jersey, New York, North Carolina, South Carolina, Oregon, Pennsylvania, Vermont, Virginia, and Washington. New Mexico recently announced its own labeling initiative (I’m not yet able to determine if it’s related to the Coalition effort). This entry was posted in GMO Information and tagged California GMO Proposition, Connecticut GMO, GE food, genetically engineered food, genetically modified food, genetically modified organism, GM, GM food, GMO, gmo label, gmo labeling, label GE food, label genetically modified food, label GMO food, Monsanto, natural label, organic, organic food, organic label, organic labeling, usda organic, Vermont GMO by GMO Awareness. Bookmark the permalink. Just saw sargento commercial telling me they went back generations and only supported natural this and that. Load of crap. Wondering if we can have someone do the leg work to make a list of companies and products that are NOT GMO. That would be very useful in empowering the people as well.